This meal will be ready in no time and the whole dish can be cooked in the one pan - midweek dinner has never been so easy. Heat the oil in a heavy-based frying pan set over a high heat. Season the trout with salt and pepper and add to the pan, then reduce the heat to medium and cook for 4 minutes on each side. Remove from the frying pan and wipe the pan clean with some kitchen paper. Melt the butter in the frying pan over a low heat. Add the garlic and cook for 1 minute, then add the chopped tomatoes. Raise the heat and bring to the boil, then reduce the heat again and simmer for 3 minutes. Add the basil and season with salt and pepper. 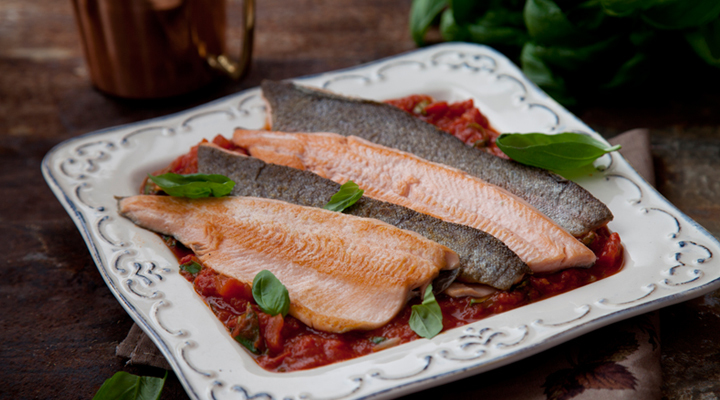 Serve with the trout and some crusty bread to mop up the sauce. Oily fish like trout cooks beautifully on the barbecue. Just make sure the barbecue grill itself is good and hot so the fish seals and doesn't stick to it. Season the fish well and rub both sides with olive oil. Place on the hot barbecue and cook for 3 to 4 minutes on each side. Alternatively, you could wrap the fillets in a tin foil parcel with a little butter, seasoning and the fresh basil, then pop it on the barbecue for 6 to 8 minutes.